The newest collection of short stories, reflections, and poems from Jill Briscoe centers on the theme of our relationship with God and what that relationship means as we live our daily lives. Jill Briscoe is able to craft stories that penetrate to the core of people, relationships, and events. She writes with a compassion that reflects God's heart for those who suffer and a heart of joy for those who rejoice. - Publisher (Foreword by Anne Graham Lotz) This collection of short stories, reflections, and poems from Jill Briscoe centers on the theme of our relationship with God, and how that relationship must be our daily priority in good times and bad. 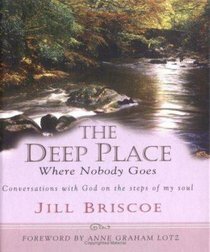 About "The Deep Places Where Nobody Goes"
(Foreword by Anne Graham Lotz) This collection of short stories, reflections, and poems from Jill Briscoe centers on the theme of our relationship with God, and how that relationship must be our daily priority in good times and bad.